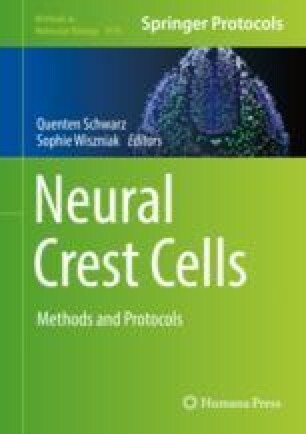 Neural crest cells are a highly multipotent and migratory cell type that are important for adult pigment pattern formation, cellular homeostasis, and regeneration. The optical transparency and accessibility of fish embryos makes them particularly well-suited to high-resolution analysis of neural crest development. However, the dispersive nature of these cells adds to the challenge of their study. We describe key protocols for the analysis of neural crest development in zebrafish and medaka, including live imaging of neural crest cells and differentiating pigment cells and transient transgenesis assays that can be used to manipulate neural crest development. This work was supported by BBSRC grant BB/L00769X/1 (R.N.K. ), Marie Sklodowska-Curie grant No. 661616 (R.D.B. ), and Japanese Society for the Promotion of Research Program for Advancing Strategic International Networks to Accelerate the Circulation of Talented Researchers S2602 (Y.N.) and Overseas Research Fellowships No. 598 (Y.N. ).